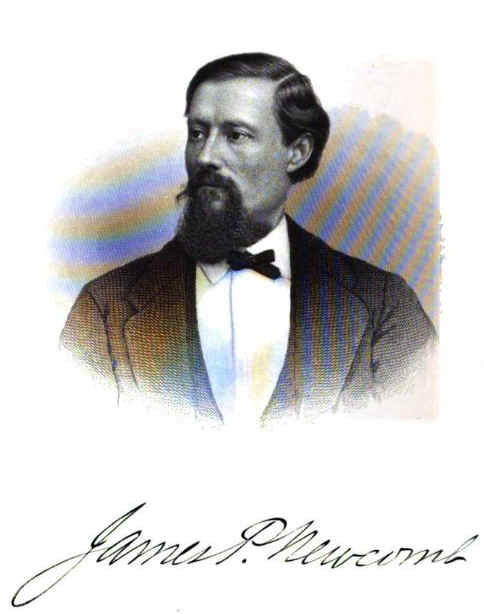 James P. Newcomb. Image available on the Internet and included in accordance with Title 17 U.S.C. Section 107. NEWCOMB, JAMES PEARSON (1837–1907). James Pearson Newcomb, journalist, the son of Thomas and Martha Margaret (Pearson) Newcomb, was born in Amherst, Nova Scotia, on August 31, 1837. The family moved to Texas in 1839, settled first in Victoria, and moved to San Antonio about 1847. Newcomb was orphaned by 1851 and began his journalistic career as a printer's devil on the Western Star. He also apprenticed for the San Antonio Ledger. In 1854, with F. M. Whitemond, he started publication of the Alamo Star. The following year he took on a new partner, J. M. West, and changed the name of the paper to the San Antonio Herald. He sold the conservative, pro-Union Herald in 1856 to attend the University of Vermont, but soon returned to San Antonio, and after editing the Herald, he established the weekly San Antonio Alamo Express, a pro-Union paper, in 1860. J. B. Baccus, Jr., became his associate in February 1861, when the Express became a triweekly paper. It was destroyed in May 1861, by the Knights of the Golden Circle and Confederate Rangers. Newcomb fled to Mexico, led a group of refugees overland to Mazatlán, and sailed to San Francisco. Newcomb served as a scout for Col. James H. Carleton's California Column in the spring of 1862 when the column marched from San Pedro, California, to the Rio Grande. The column went into permanent camp, and Newcomb requested permission to return to San Francisco, where he published Sketch of Secession Times in Texas and Journal of Travel from Texas through Mexico to California (1863). He then became editor of the San Jose Tribune. When the paper folded he was paid with equipment instead of wages; he used the equipment to start the San Jose Times. After abandoning that endeavor he went on a mining expedition to Arizona and finally returned to California, where he edited the American Flag in San Francisco. Letter, James P. Newcomb to Henry Arthur McArdle, October 26, 1906. Coiurtesy of the Texas State Library and Archives Commission. Image available on the Internet and included in accordance with Title 17 U.S.C. Section 107. Grave of James P. Newcomb. Courtesy of Billion Graves. Image available on the Internet and included in accordance with Title 17 U.S.C. Section 107. In 1867 Newcomb returned to San Antonio and bought an interest in the San Antonio Express, which supported the policies of Governor Edmund J. Davis. He was registrar of voters under the Reconstruction Acts and served as secretary of state during the Davis administration. Upon leaving office it was alleged that Newcomb had defrauded the state of $9,000. He was acquitted in 1876. In 1874 Newcomb became owner and editor of the Republican party paper, the State Journal. He ran as a Republican candidate twice and lost both times. He ran for Congress in 1876 and for lieutenant governor on the party ticket with Andrew Jackson Houston in 1892. He was admitted to the bar in 1877, but he practiced very little. In 1879 Newcomb joined A. W. Gifford to publish the Texas Sun, a paper Gifford had moved from Kansas City to Houston. Then in 1880 Newcomb began publishing The Surprise, a forerunner of the Evening Light, which Gifford and Newcomb founded in January 1881. Newcomb was editor and publisher of the paper until 1883, when it was reorganized, and the name was changed to the San Antonio Light. After that he owned a series of campaign papers, including the Plumed Knight (1884), the Evening Paper (1886), the Campaign News (1888), and the White Republican (1890). He also edited a trade journal, the National Liquor Dealer, for a time beginning in 1895. Newcomb married Janie Davis in California on August 31, 1864. She died, along with their infant son, in the winter of 1865–66. In 1872 Newcomb married Antoinette Hitchcock in Vermont. The couple had four surviving children, including James P. Newcomb, Jr., who served as San Antonio Water Board secretary for many years. Newcomb spent the last years of his life operating his farm, Great Oaks, near San Antonio. He was an Episcopalian. Newcomb died on his farm on October 16, 1907, and was buried in San Antonio at Alamo Masonic Cemetery. Frederick Charles Chabot, With the Makers of San Antonio (Yanaguana Society Publications 4, San Antonio, 1937). John Fowler, James P. Newcomb (Department of Journalism Development Program, University of Texas at Austin, n.d.). Jacobina Burch Harding, A History of the Early Newspapers of San Antonio, 1823–1874 (M.A. thesis, University of Texas, 1951). William S. Speer and John H. Brown, eds., Encyclopedia of the New West (Marshall, Texas: United States Biographical Publishing, 1881; rpt., Easley, South Carolina: Southern Historical Press, 1978). Handbook of Texas Online, Ernest B. Speck, "NEWCOMB, JAMES PEARSON," accessed April 20, 2019, http://www.tshaonline.org/handbook/online/articles/fne19. Uploaded on June 15, 2010. Modified on October 6, 2016. Published by the Texas State Historical Association.